The Colt McCoy era in Washington came to an abrupt halt Monday night, when McCoy suffered a broken leg against the Philadelphia Eagles and all but certainly ended his season. It happened fast, and McCoy tried to play on it for another two downs, but eventually it became obvious he couldn’t continue. Already down Alex Smith, who suffered his own gruesome leg injury two weeks ago, Washington was forced to reach down and pull up [gulp] Mark Sanchez, who has been with the team for all of 14 days. His night actually started beautifully, with a 90-yard touchdown run from Adrian Peterson on Sanchez’s very first snap in the NFL since 2016. But that right there was the end of the good times. Sanchez finished with 100 yards passing on 21 attempts, mostly on check-downs and screens. His longest pass through the air that was actually caught was caught by the wrong team, and Sanchez generally looked very much like a guy who barely knows his teammates’ names, let alone the playbook. Washington had just over 13 total minutes of possession after McCoy left the game, and went punt-field goal-punt-punt-interception-punt-punt after Peterson’s long touchdown, and fell to the Eagles by the score of 28–13. They’re now 6–6 on the season, and third in the NFC East. They’ve lost four of five, and Mark Sanchez is their quarterback, and they’re dead. They’re dead. 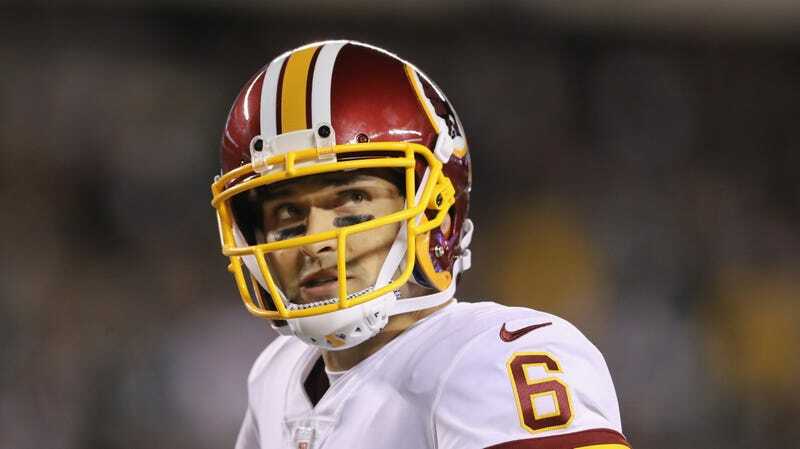 Circumstances being what they are, Washington will be needing another quarterback to backup The Sanchize. We know a guy! Washington Needs A Quarterback. I Know A Guy!